Bede is most well-known for his 'History of the English Church and People', but he wrote many other books that were well-read in the middle ages. He was famous for his commentaries on books of the Bible. This manuscript has a copy of his 'Commentary On Luke'. One of the secrets of his success as an author was his ability to organise and present complex ideas clearly. Drawing upon earlier commentaries on the Gospel of Luke by authors such as Augustine and Jerome, he compiles and links together excerpts on related themes to enrich the understanding of post-biblical theologians. The manuscript belonged to the library of the Benedictine monastery at Reading. Ownership by a monastery would be typical for a copy of this book. It would have been used by theologians in their Bible study. Bede begins his commentary with the name of the 'Blessed Luke'. He quotes the beginning of the Gospel of Luke and follows it with phrase-by-phrase commentary. Originally, he had noted his sources in the margin, but often scribes disregarded his admonition to copy his references. The note and numbers in the margin indicate verses quoted from Luke 1:1-4--an aid to the reader. 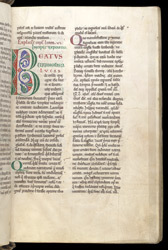 The page is plain and clearly laid out, with only the first letter of the commentary decorated with colour, an indication of both the importance given to the book and its use as a book for study rather than display.